Halloween is a fun time of the year, especially at Disney World. And the fall is a great time to visit, thanks to lower crowds and cooler weather. 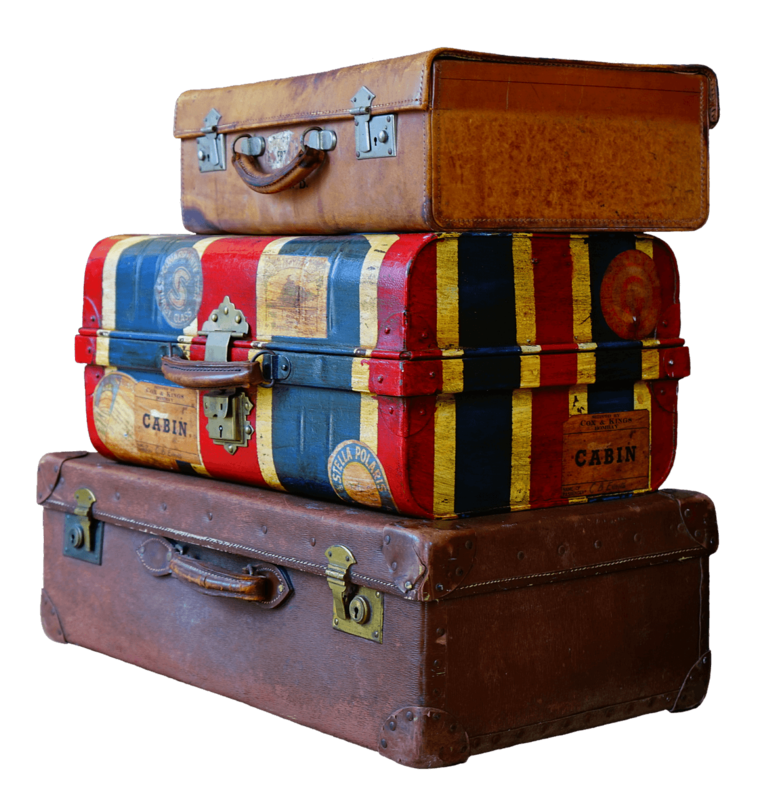 Do you have a trip planned for this fall? Wondering what special Halloween treats Disney has to offer? 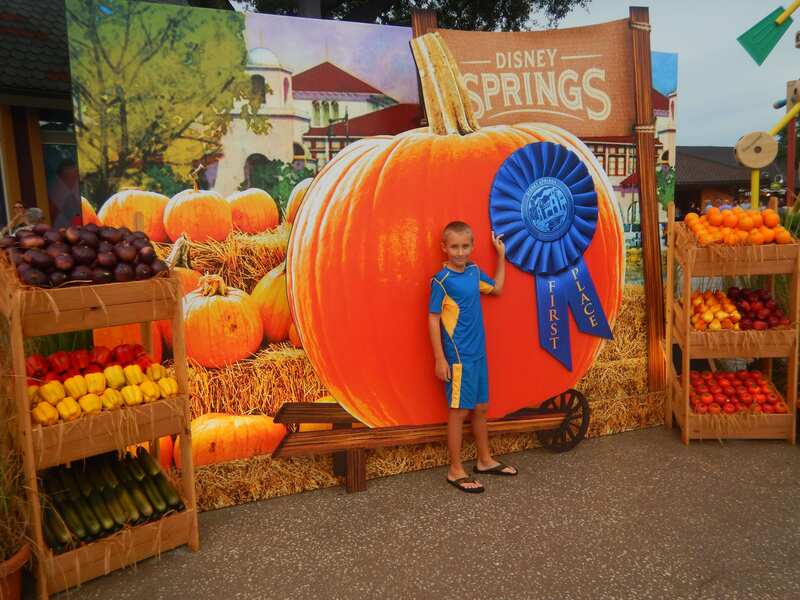 Read on to find out everything to expect from Halloween at Disney World! 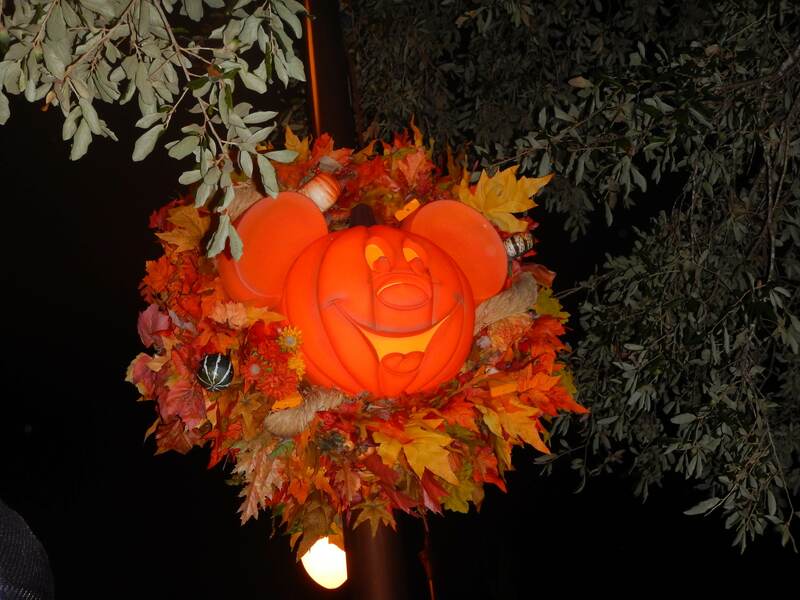 During Halloween at Disney World, you will see special decorations, but they are limited. Only the Magic Kingdom and Disney Springs are decorated for the holiday. At the Magic Kingdom, fall-colored banners adorn the buildings on Main Street, U.S.A. Jack-o-lanterns dot the ledges and windowsills of these buildings too. The light poles have Mickey-shaped jack-o-lanterns on them as well. 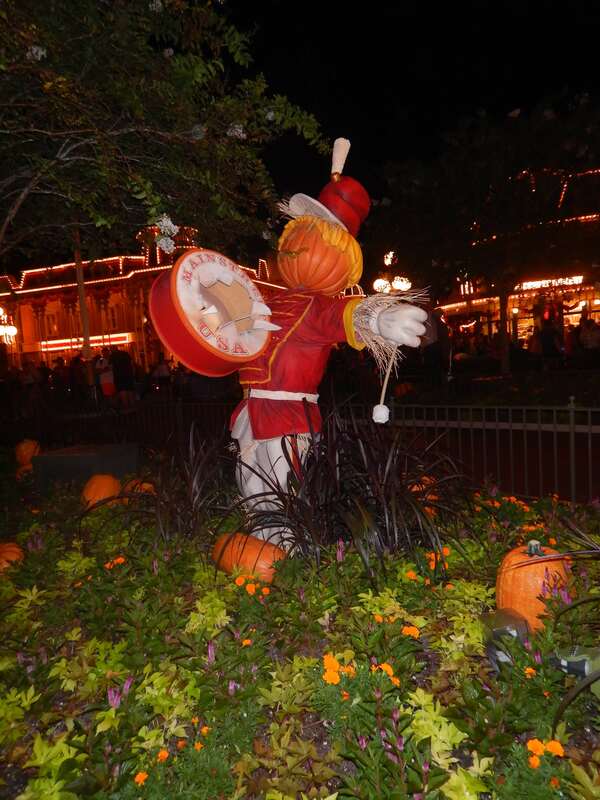 And as soon as you enter the park, you will see some pumpkin scarecrows in the Town Square planters. 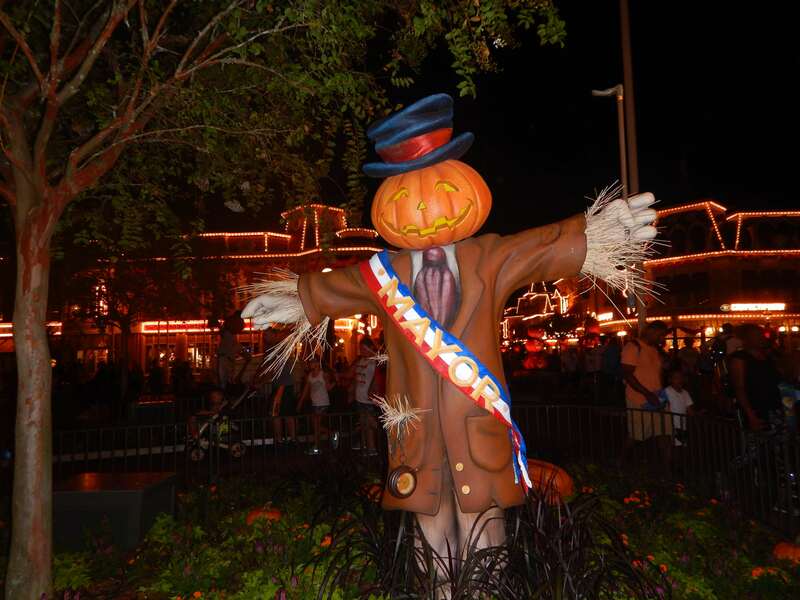 The scarecrow mayor at the Magic Kingdom during Halloween. The Disney Springs holiday decorations are themed more for fall than Halloween. They include fall leaves and harvest inspired items such as pumpkins and corn. You can get some great Halloween photos with some of these decorations as backgrounds. The biggest draw during Halloween at Disney World is Mickey’s Not-So-Scary Halloween Party. These parties are held in the Magic Kingdom on select nights from August through October. You must buy a separate ticket to the party in order to attend. Party tickets costs between $85-125 per person, depending on which night you attend. The closer to Halloween you go, the more the tickets will cost you. Halloween night tickets are the most expensive option. The party starts at 7 pm and ends at midnight. Your party ticket will, however, allow you to enter the Magic Kingdom at 4 pm on the day of the party without using a separate theme park admission ticket for that day. Some of the Magic Kingdom Halloween decorations. The highlights of the party are the Boo to You Parade, Happy Hallowishes fireworks, and Hocus Pocus Villians Spelltacular stage show. Of course, you can’t have a Halloween party without some trick-or-treating! During the party, you can also meet some popular characters in their Halloween costumes, as well as some characters who are only out during the parties. These rare characters include the Seven Dwarfs, Jack Skellington, and Moana. Disney’s photographers will take some magical photos of your family during the party too. You will also find some special entertainment and treats that are available only during the parties. For more information about the Halloween parties, see Disney’s website. One of the best parts of Halloween is the treats! And it’s no different at Disney World. During the Halloween season, you can find special holiday-themed treats at various locations throughout the parks. 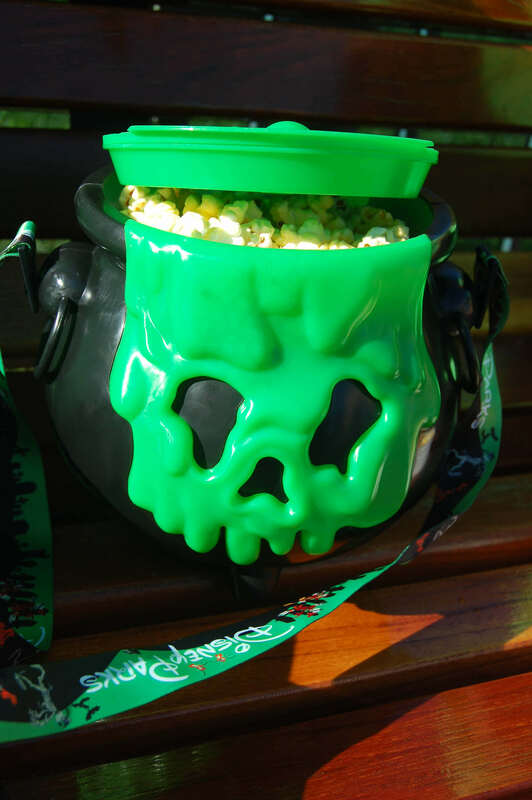 These include everything from a refillable popcorn cauldron to Halloween themed cupcakes, such as the not-so-poison apple cupcake. There are also a few savory treats offered too. Some of these holiday treats are only offered during Mickey’s Not-So-Scary Halloween Parties, while others are available on a daily basis during the Halloween season. Halloween is a fun holiday for kids and adults alike. Celebrating Halloween at Disney World makes it even more fun. From the decorations to the treats and parties, Disney World makes the holiday one to remember. Add in the cooler temperatures and somewhat lower crowds, and this is an awesome time to visit. For information on Christmas at Disney World, see my posts about Mickey’s Very Merry Christmas Party and tips for Christmas at Disney World. For help planning your trip, see my step-by-step guide, my quick tips for planning your trip, and the best resources for trip planning. 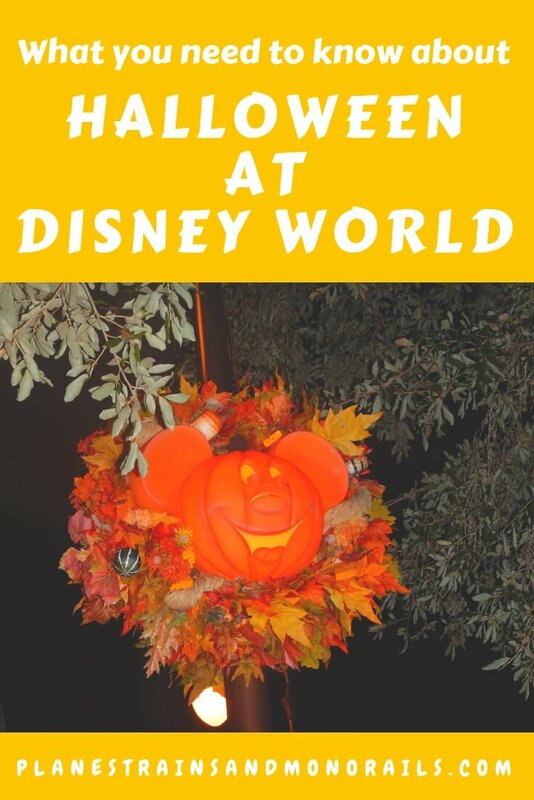 Have you celebrated Halloween at Disney World? Leave me a comment and let me know your thoughts. Happy travels!